At the 2017 Illumine Songwriting Weekend, we had a timed songwriting challenge where participants were given an hour to write a song that could be used as a Blessing at the end of a service. All of the resulting songs were great, but Caleb's stood out. 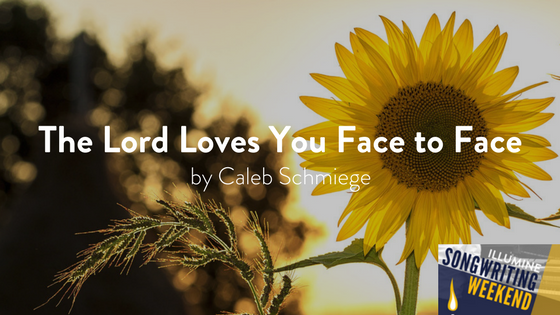 Caleb chose to focus on how undeserving we are of the blessings God gives us and juxtaposes that with how God gets up close and personal with us and blesses each of us individually. Stylistically, Caleb's influences shine through as it sounds like a classic Relient K song. While it really makes most sense to use this at the end of a service, beyond that it has very few limits to when it can be used. It fits in any season or setting. Musically, it's quite easy to pick up, but very versatile in it's setting. You can lead it with simply a piano (as Caleb does in the recording) or with just a guitar, or with a full band.